Join the revolution! EnterYourHours.com is the preferred billing system for all types of legal practices. Legal Billing Software is architected to adhere to the needs of legal practices, otherwise known as law firms. Almost all law firms need software that allows them to bill by the hour, provide detail on invoices, manage retainers, and track time. EnterYourHours.com was built to handle all of these needs. In fact, EnterYourHours.com is more than legal billing software. This legal billing software system contains features that allow law firms to bill hours in ways they never considered. Time tracking is a key component to legal billing software, and EnterYourHours.com's timer is extremely feature rich. 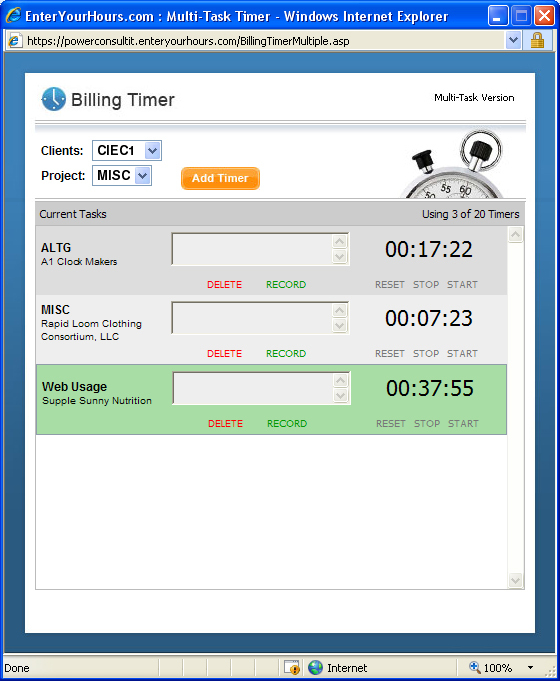 The timer is actually a multi-timer, allowing users to track multiple clients at once. For example, if you are working on Client A's case, and then Client B calls on the phone to discuss an urgent matter, you can stop Client A's timer, and start Client B's timer. Then, when you finish with Client B, you can start Client A's timer again. You can track timers for up to 20 clients in a single day. At the end of the day, you can record all of your clients' time. The Timer also keeps a back-up log in case you lose your Internet connection in the middle of the day. Legal billing software requires a billing work flow. Law firms will have unbilled hours, hours ready to be billed, and invoiced hours. EnterYourHours.com keeps track of it all with an easy to use filtering interface. Additionally, invoices are extremely configurable. Administrators can choose to group the law firm's invoices by project, by task (known as a duty), by worker, and even by day. Which columns appear on the invoice detail is also configurable. Most legal billing software does not have the billing collaboration features of EnterYourHours.com. Administrators can assign partners the ability to adjust associates hours. If a partner colloborates with an associate, but the law firm does not want the client to see multiple entries, the partner can simply adjust the associate's hours up and the EnterYourHours.com billing engine will track the information through payroll. Similarly, if the associate takes too long to bill hours, the partner or law firm can adjust the associate's hours down to the client, and the client will be billed the lower number, but the associate will still be credited with the hours (of course a partner or administrator can also simply edit the associate's hours so the associate gets paid the same amount of hours that the client gets billed). 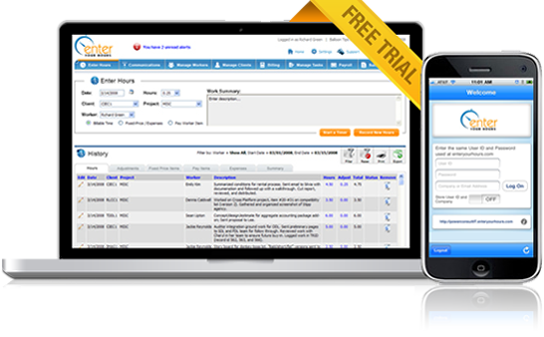 There are many more features of EnterYourHours.com, your best legal billing software solution. To learn more, you can view our features page, or take one of our product tours. EnterYourHours.com does not require any installation and runs entirely in your browsers, over secured, encrypted connection, so all legal obligations to your clients are met. Sign up for our fully functional 14-day free trial and try it out.